Once upon a time there was a pear. This pear was quite plump and all the other pears aspired to be as juicy. On sunny days, the pear would make sure to find a leaf or two that could provide adequate shade. No one knew exactly how the pear had become so plump and juicy. Some of the other pears speculated that it had retained all the water intended for some of the less fortunate pears on the branch while others simply reckoned it was blessed to be that way. One thing everyone could agree upon was that the pear was destined for something great. The pear itself knew the other pears were jealous but it couldn’t be bothered with such petty affairs—it was, after all, destined for greatness. 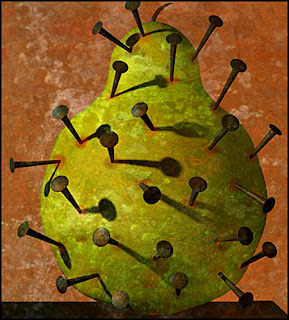 Summer was coming to a close and all the pears were busy making their final preparations for the harvest season. Some would be chosen and others, if they had not grown enough, would be left to the birds and the fall frosts. Most of the pears were busy drinking up as much water as they could and spent their afternoons ripening in the sun’s glow as they turned in the warm summer breeze. The plump and juicy pear became so ripe that its branch began to lower itself to the ground—being picked first was almost guaranteed. As you would expect, the plump and juicy pear was the first to be picked and it was very proud indeed. That night, the farmer’s wife decided to make a pie from some of the pears and began to look through the baskets her husband had harvested earlier that day. One by one she removed pears from the basket. Each pear she removed was pleased to have found a purpose so quickly. Each pear, that is, except for the plump and juicy one. “I’m too important to be mixed up in some pie,” thought the pear, “I’m destined for greater things than this!” Frantically looking around, it noticed a loose nail sticking out of the basket and thought, “If I embed this nail in me, the farmer’s wife will not use me in the pie and I’ll be able to fulfill my greater destiny.” With that, the pear rolled into the nail just as the farmer’s wife reached to pick it up. “Oh dear,” said the farmer’s wife, “what a shame this pear has a nail in it. Do be more careful when you toss them in the baskets dear.” Her husband mumbled his agreement from the other room as she set the plump pear aside. “Such a plump and juicy pear too,” she muttered to herself, “I suppose you were destined for other things,” and tossed the pear into the garbage. The pear was so caught up in this latest development that it didn’t notice the farmer’s son had picked up the garbage can and had taken it out of the house. Dread soon overtook the pear when it realized that the farmer’s son intended to feed him to an animal. Quickly, the pear rolled around inside the garbage to acquire more defenses and managed to embed several toothpicks, some broken glass, a bottle cap and a twisted paper clip. The boy set the garbage down outside the stables and picked the pear out of the can. As he did so, he cut himself on the embedded shard of glass and dropped the pear into the mud. Before the pear could celebrate its near miss, the boy promptly kicked it into the nearby grove. As the sun came up, the pear could see that it was now at the base of the very tree that had given it life. Because of all the rubbish embedded in the pear, not even the birds would pick at it. The other pears still in the tree looked down at the once plump and juicy fruit and shook in the wind. Their fallen comrade had become so untouchable that the only destiny left was to rot.